You are here: Home / Crochet Other / Reviews / Book Review / Doilies Updated. 9 Modern and Colorful Patterns. 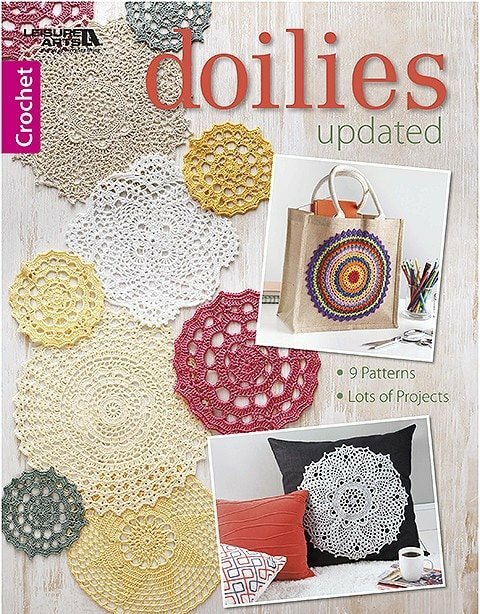 Doilies Updated includes 9 modern and colorful patterns for you to crochet. Beautiful and lacy doilies are really balanced works of art. You can display traditional doilies on counter-tops, hutches and tables. You can even take your finished doily and frame itm as artwork for your wall. You can create fun sun-catchers, make banners, or even decorate your home with doily pillows and doily rugs. In Doilies Updated, 9 beautiful doily patterns have been given an update with fun colors and even heavier weight yarns to allow you to create lovely projects you can proudly display in your home. 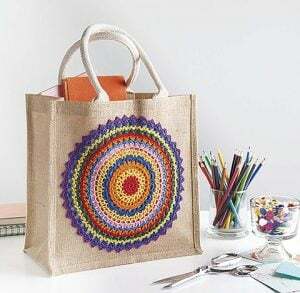 Mandala Tote (EASY). Finished size: 10.5 inches diameter. Supplies: Cotton Size 10 (Lace Weight = 0) and a 1.8 mm (size 6) steel crochet hook. 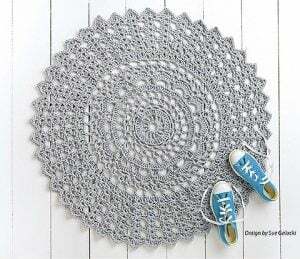 Round Doily (EASY). Finished size: 10.5 inches diameter. Supplies: Cotton Size 10 (Lace Weight = 0) and a 1.8 mm (size 6) steel crochet hook. Rug (EASY). Finished size: 35.5 inches diameter. Supplies: Bulky Weight Yarn  and a 9 mm (M/N) crochet hook. Triangle Doily (EASY+). Finished size: 7 inches diameter. Supplies: Light Weight Yarn  and a 4 mm (G) crochet hook. Banner (EASY+). Finished size: 3.75 inches tall. Supplies: Cotton Size 10 (Lace Weight = 0) and a 1.8 mm (size 6) steel crochet hook. Triangle Pillow (EASY+). Finished size: 14 inches from point to point. Supplies: Super Bulky Weight  and a 6.5 mm (K) crochet hook. Elegant Pillow (INTERMEDIATE). Finished size: 21 inches diameter. Supplies: Medium Weight Yarn  and a 5.5 mm (I) crochet hook. Elegant Doily (INTERMEDIATE). Finished size: 9.5 inches diameter. Supplies: Cotton Size 10 (Lace Weight = 0) and a 1.65 mm (size 7) steel crochet hook. Oval Doily Pillow (INTERMEDIATE). Finished size: 4.25 inches wide X 9.5 inches long. Supplies: Super Fine Weight Yarn  and a 3.25 mm (D) crochet hook. Oval Doily (INTERMEDIATE). Finished size: 3.75 inches wide X 7.75 inches long. Supplies: Cotton Size 10 (Lace Weight = 0) and a 1.65 mm (size 7) steel crochet hook. Table Scarf (INTERMEDIATE). Finished size: 11 inches wide X 26 inches long. Supplies: Bulky Weight Yarn  and a 9 mm (M/N) crochet hook. Quatrefoil Doily (INTERMEDIATE). Finished size: 8.5 inches from corner to corner. Supplies: Cotton Size 10 (Lace Weight = 0) and a 1.65 mm (size 7) steel crochet hook. Chair Pad (INTERMEDIATE). Finished size: 18 inches from corner to corner. Supplies: Medium Weight Yarn  and a 5.5 mm (I) crochet hook. Sun Catcher (EASY). Finished size: 7 inches diameter. Supplies: Cotton Size 10 (Lace Weight = 0) and a 1.8 mm (size 6) steel crochet hook. Star Doily (EASY). Finished size: 7.5 inches diameter. Supplies: Cotton Size 10 (Lace Weight = 0) and a 1.8 mm (size 6) steel crochet hook. Pot Holder (EASY). Finished size: 7.5 inches diameter. Supplies: Cotton Size 10 (Lace Weight = 0) and a 1.8 mm (size 6) steel crochet hook. Valance (EASY). Finished size: 40.5 inches wide and 9 inches high. Supplies: Cotton Size 10 (Lace Weight = 0) and a 1.8 mm (size 6) steel crochet hook. Square Doily (EASY). Finished size: 4.5 inches wide. Supplies: Cotton Size 10 (Lace Weight = 0) and a 1.8 mm (size 6) steel crochet hook. 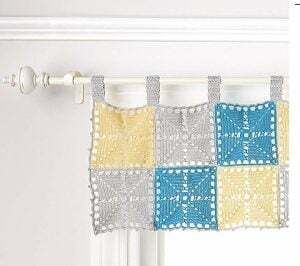 Table Runner (EASY). Finished size: 24 inches wide and 48 inches long. Supplies: Fine Weight Yarn  and a 3.75 mm (F) crochet hook. Coaster Set (EASY). Finished size: 4.75 inches diameter. Supplies: Cotton Size 10 (Lace Weight = 0) and a 1.8 mm (size 6) steel crochet hook. Flower Sachet (EASY+). Finished size: 4.75 inches diameter. Supplies: Cotton Size 10 (Lace Weight = 0) and a 1.8 mm (size 6) steel crochet hook. Abbreviations, symbols and terms are included on page 44. Crochet terms are included with helpful diagrams beginning on page 45. You are not limited to using the yarn and threads listed below to make these projects. You can use any yarn brand or color you want, simply by matching up the gauge provided in the pattern. COASTER SET. Aunt Lydia’s® Classic Crochet Thread™, size 10 and Aunt Lydia’s® Fashion Crochet Thread™, size 3. Would you like to win an eBook copy of Doilies Updated? If you can’t see the Rafflecopter widget below, please click here to enter. 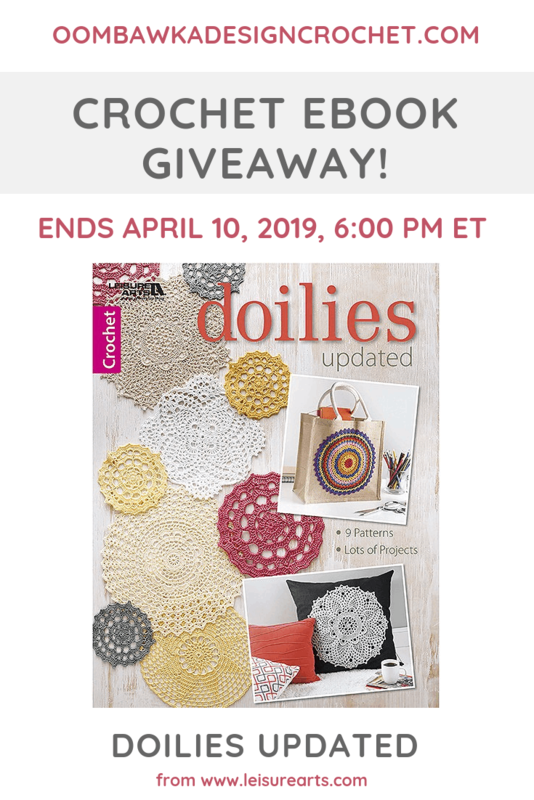 I’d like to thank Leisure Arts, Inc. for providing me with the review copy of Doilies Updated and for the giveaway copy for my readers! I am wanting to make more doilies to create artwork for my wall. I want to place doilies on a large canvas. The doilies in this book are beautiful. I love making doilies and this has some great patterns! how about a review on https://www.leisurearts.com/charity-guide-for-crocheters.html I have started crocheting for charities lately. I enjoy fine stitching. The dreamcatcher is a favorite. Grannies In Bloom. Perfect time of the year with all the flowers starting to come up. Your reviews are very thorough and concise. If I’m leaning towards buying prior to your review I’m almost sure to buy it after reading it.